I enjoy food markets. I love to see fresh food laid out for sale, with its bright colours and the wonderful smell of fresh fruit and vegetables. That is one of the pleasures of life. Melbourne has a famous market which has over 10 million visitors each year. It sells fresh fruit and vegetables, meat and fish, cheeses and other specialty foods and lots of non-food items such as clothing, souvenirs and jewellery. It’s called Queen Victoria Market. Queen Victoria Market is 130 years old. It is found in the main central business district of Melbourne and is easy to get to by tram. It is open 5 days a week and is closed on Mondays and Wednesdays. It is the place to go if you want your food really fresh. On Tuesday, Thursday, Friday and Saturday, it opens at 6.00am. Now that’s early. It closes at 2.00pm on Tuesday and Thursday, 5.00pm on Friday, 3.00pm on Saturday and 4.00pm on Sunday. Sunday is more about specialty goods rather than fresh food and tends to be more for families, with children’s rides and other entertainment activities. On my visit today, it was Thursday. I took my motorcycle and there was plenty of parking. Queen Victoria Market (or ‘Vic Market’ as Melbourne people call it) has a number of different areas which specialize in different types of products. Two of my favourites are the Deli Hall and the Meat Hall. These areas of the market are inside and are fully air conditioned, which is great if it’s one of those hot Melbourne summer days. The Deli Hall is short for Delicatessen Hall and includes wonderful dairy products such as cheeses from all over Australia and the rest of the world. The Deli Hall also offers cured meats like ham, bacon and sausage. There are also shops which have a wide range of breads. The high grain sourdough bread is my favourite. Today on my visit I bought some Strudel with poppy seed. That is a real favourite of my wife and mine too. The Meat Hall has a fantastic range of fresh meat, seafood and poultry. There are 20 butchers, 10 fishmongers and 3 fresh poultry shops. And the food is all well priced and top quality. On my visit today I bought some juicy pork and some beautiful beef steaks. As well as these two areas, of course there is the fresh fruit and vegetable area. Here you can always get a real bargain and it’s all fresh. Today the peaches and nectarines looked especially nice. I also love the mangoes. They are so juicy and sweet. Other areas in the market include the organic produce area. Fruit and vegetables in this area are grown without any insecticides or chemical fertilizers and are called organic. The General Merchandise section includes things such as clothing, shoes and jewellery. And Vic Market also has great places to sit down for a nice meal such as a pizza or a well cooked steak with chips and salad. And to finish your meal, you must have a real Melbourne coffee. 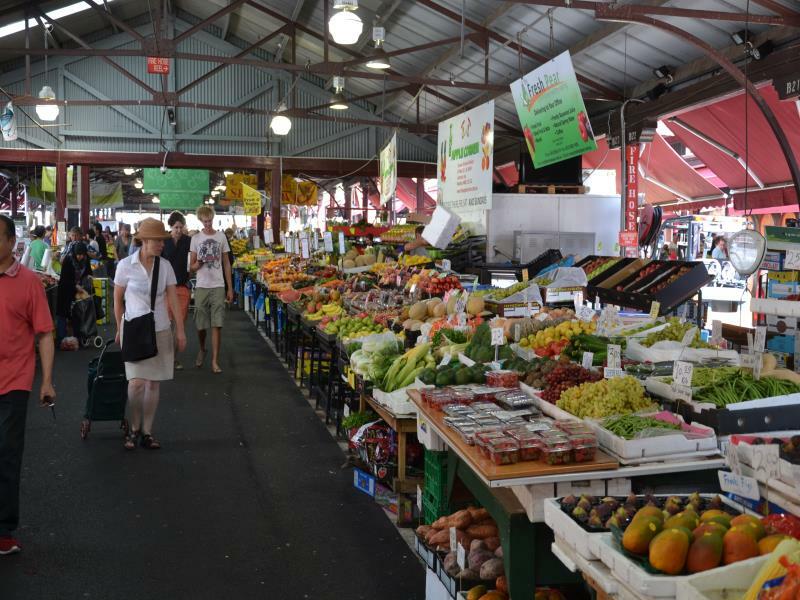 Of course Melbourne has many, many shops and shopping centres, but for a real adventure when buying your fresh food for the week, the Queen Victoria Market is the place to go in Melbourne. If you have a question or a comment to make, please leave it by clicking the comments link at the top of this story. You can leave your comment in English or in any language and I will translate it. Or, you can send me an email at rob@slowenglish.info. I would like to hear any suggestions you may have. I would especially like your suggestions for podcast topics. Goodbye until next time. Podcast 9 Quiz - Did you understand the podcast? True or False? – Rob enjoys going to food markets. True or False? – If you want to buy fresh fruit and vegetables in Melbourne, then Victoria Market is a good place to go. True or False? – Queen Victoria Market is closed on the weekend. True or False? 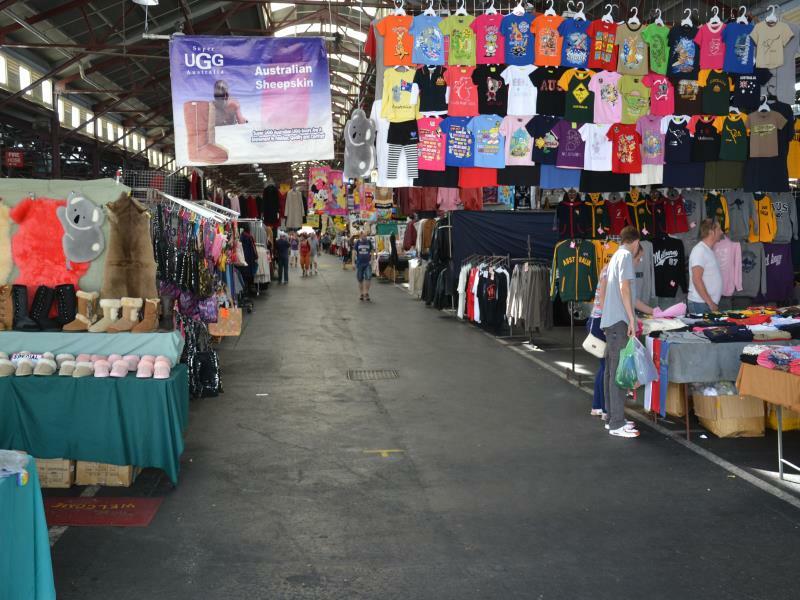 – On Tuesdays, Queen Victoria Market opens at 6.00am and closes at 2pm. True or False? – Sunday is all about buying fresh food. True or False? -The people of Melbourne use the term ‘Vic Market’ when talking about Queen Victoria Market. True or False? – If you wanted to buy dairy products at Queen Victoria Market, you would go to the Meat Hall. True or False? – At the Queen Victoria Market you can buy cheeses from all around Australia. True or False? – Rob thinks that the food at Queen Victoria Market is a little expensive. True or False? – Rob thinks that buying food at Queen Victoria Market is a real adventure. I have a question. When you say that Deli market “is short for Delicatessen Hall” short means near? I´ve never heard the construction to be short for. This weekend, there, in Melbourne, you have the F1 race. How that affects your daily life? In Spain, we had two races, in Barcelona and Valencia just a couple of years ago. Now, because of the crisis, Valencia´s race has disappeared of the championship. In Jerez, where I live, we have a track and a race for motorcycles. As a rider, I suppose you´ve been a supporter of Casey Stoner and Mike Dooham. The weekend when the race takes place, Jerez is invaded by motorcycles. I try not to take the car, because there are thousands of them in the roads. But it´s a good promotion for the town and a good source of money. Street markets are everywhere in the south of Spain. Yes, they are a very pleasant place to go. You can find “plazas” (squares) which are buildings where food is sold and are open from Mondays to Saturdays and “mercadillos” (literally small markets), in the streets, where clothes are sold, although also some food which usually only open once or twice a week. The best of this kind of markets is that you usually only buy what you really need: fruit, meat o vegetables. However, when you go to a supermarket the temptations are too strong and always buy some candies or snacks. I´ve got two kids and I try to teach them that fruit is healthier than other things. I´m worry because nowadays kids reject to eat fruit. Some years ago, I went to Norway and it was surprising how kids ate a lot of fruit. Sorry for the too long comment. Thank you for your postcast and for showing to the world your hometown. Many thanks for your comment. Yes, ‘short for’ is quite a common phrase which means a shortened form of, or an abbreviation of, a phrase. For example, ‘etc’ is short for ‘etcetera’. This weekend is indeed the F1 race here in Melbourne. However, it is near the centre of the city which is about 30km from where we live on the outskirts of Melbourne. So there is no effect really on us personally. However my wife and I were in the city today to go to a show at the Victorian Arts Centre and we could just hear the F1 car engines as we walked down the street. There is certainly some impact on those who live near the track. Every year there is a protest group who don’t want the F1 race to be at the Albert Park track. Every year they make their protest but the F1 race goes on with thousands of car loving Australians attending. It also brings a lot of visitors to Melbourne and they spend money so it is good for the economy. We also have a MotoGP motorcycle race here each year at the Phillip Island track, which is about 90 minutes from Melbourne. Motorcyclists attend in their thousands and I think it is great. We also have the Superbikes which attracts large crowds at the same track. I have driven my car in club sprints around the Phillip Island race track and it is a wonderful high speed track. That’s interesting to learn about the markets in Spain. I love these sort of places as they are always full of colour and the food is generally cheap. Thanks again for your excellent comment.